Welcoming Karen Morgan, new Newsletter Editor! SCCHA welcomes Karen Morgan as the new Newsletter Editor! In addition to a great deal of volunteer work, I've had a long career in educational publishing. I'm often asked to design digital and print materials for a variety of causes, my favorites being those protecting equine interests and open space. I worked for a small scientific press for many years, preparing raw manuscripts for publication in international journals and texts; I edited theses for foreign students at NPS; and I created illustrations for everything from logos to engineering matrices to medical diagrams. I also worked for CTB McGraw-Hill, producing assessment tests for K-12. I believe that the SCCHA newsletter is a vitally important tool for keeping horse owners and riders connected and up-to-date on local equine news. I'm honored to be a part of the process that delivers it to your inbox. Please don't hesitate to submit content that you think might benefit other members. I look forward to hearing from you!" 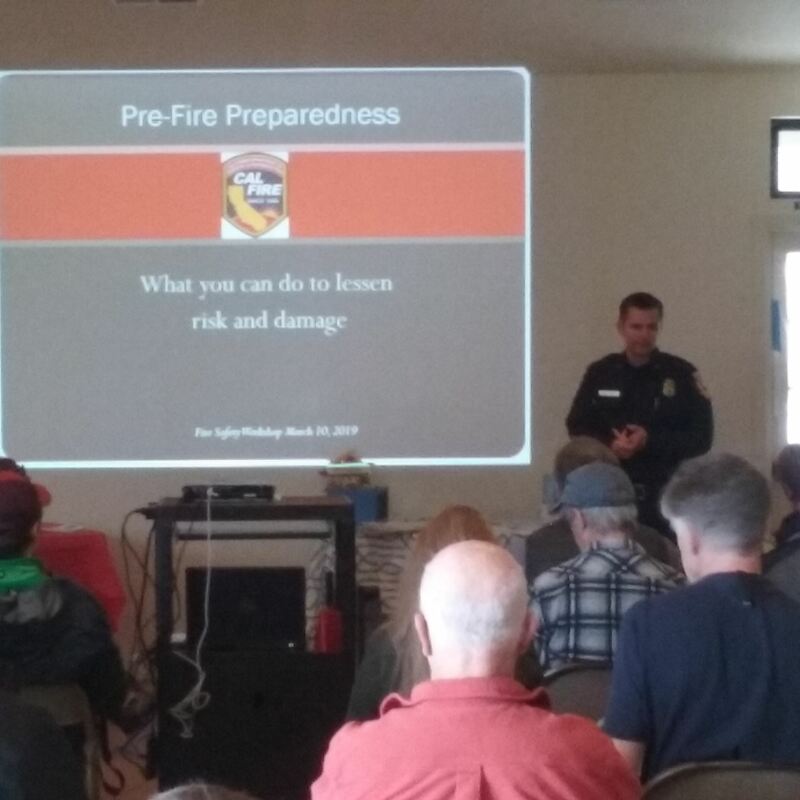 With about 50 people in attendance, the Fire Safety Workshop was well attended on Sunday March 10. Many attendees were from home owners associations and other agencies. Cal Fire did the presentation on Fire Safety and Angie Gruys from the Resource Conservation District of Santa Cruz County discussed funding sources available and current/ongoing projects. 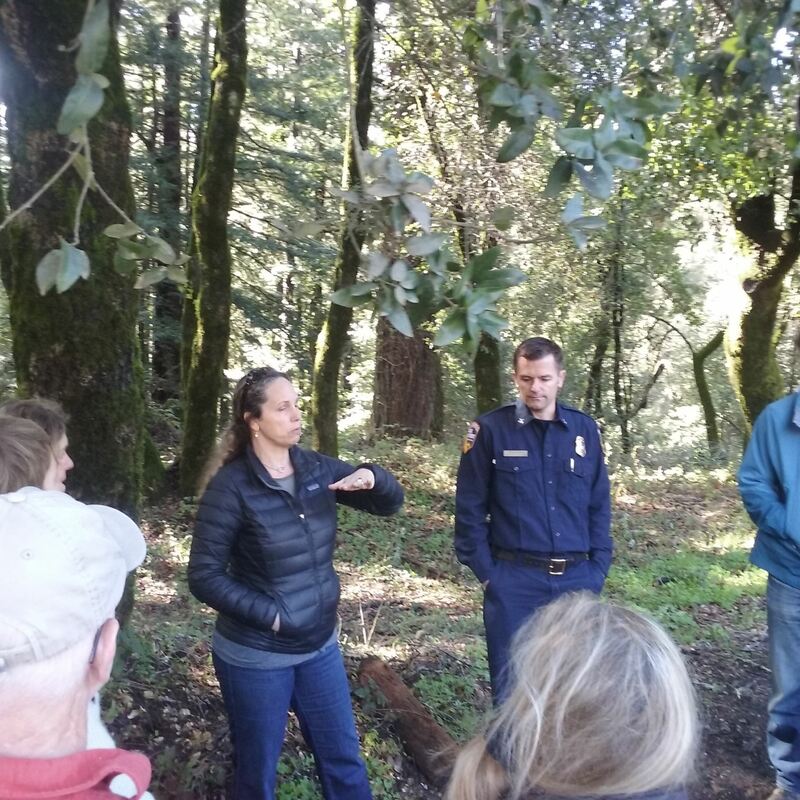 In walking the showgrounds, the Cal Fire Rep made some suggestions for trimming up some of the trees to follow best practices of defensible space. 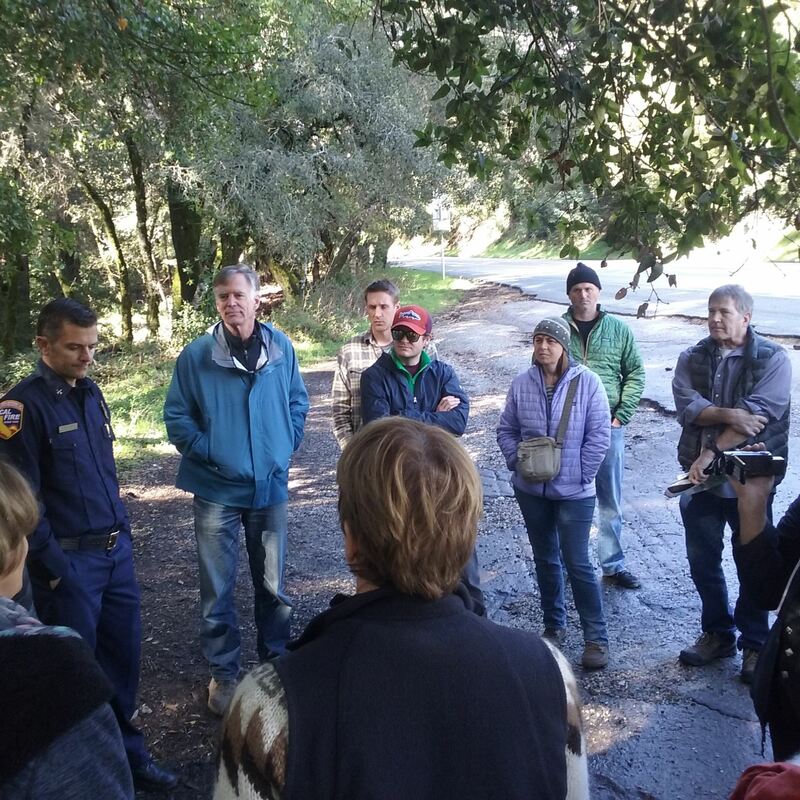 The group walked up to the parking lot of Henry Cowell for a talk about the current completed project along Graham Hill Road. 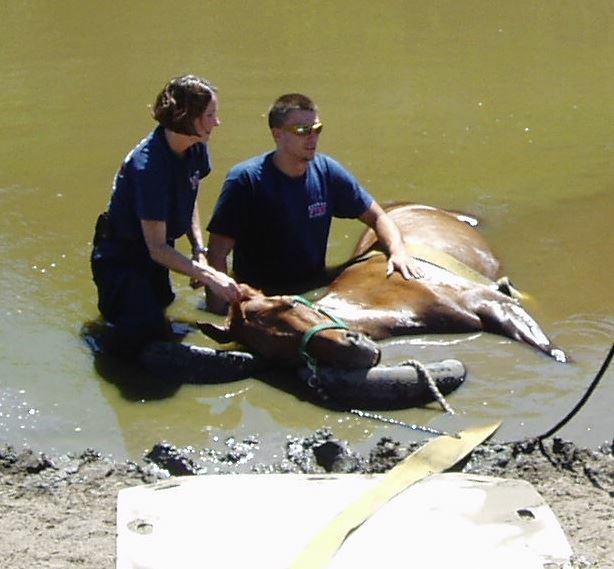 Kenneth Coale, leader of Equine Evac. did a great presentation on Equine Evac and many of the attendees were aware of the need for animal/livestock evacuation and his talk made them really focus on what it takes to evacuate. Kudos to Kenneth! SCCHA adult Members choose who will serve on the Board of Directors by voting in person on March 19 @ the clubhouse, 6:30pm. This year we have 10 folks running for 8 Director positions; and 3 folks running for officer positions (President, Treasurer, Secretary). Candidates have each provided a statement for your consideration prior to the vote, listed below. Candidates are listed alphabetically, *denotes a current board member. I am a lifelong horsewoman and current SCCHA President. My past career as a Program Manager and my current career as a Real Estate Agent require skills that have helped me in many ways this year. Both included helping people choose among multiple desires and priorities in order to take positive action toward a common good. This past year my biggest passion for SCCHA was to reach out to the membership to ensure that every step the board takes and every penny we spend is directed towards the betterment of the club and the support of our members to fully enjoy their membership. Our current board members came together and made significant progress towards that end. We’ve become a team and we’ve learned what the job takes and how to work together to make things happen. I’d like to be considered to return as club president and continue that progress and make 2019 the best year yet. Hello! I have been an SCCHA board member for 5 years and am currently Vice President. My association with the club began with the Fireworks Ride (I’ve managed it for a number of years now) and has steadily grown: I am on the Trails Committee, helping keep our trails open and liaising with other parts of the community to open up new ones; I am on the election committee; I helped setup our website and automate many activities; I routinely help with events as they come up, in support of other board members and our great club membership. I heartily agree with other board members in that we’ve had a stellar year, making physical improvements and growing our membership. If re-elected, I look forward to working on a Capital Funds Raising committee so we can continue to make improvements: stay tuned for more info on this! And of course, there is always the Fireworks Ride, July 13th this year. Got time to help? Thanks for your consideration. Hello, my name is Jaime Donato and I am running for a seat on the SCCHA 2019 board. I have served on the board for two years now and would like to continue. We are currently working on projects that the membership asked for as a result of the membership survey that went out last year. I would like to see those projects to completion and stay with the current board to manage the completion of those project. Greetings! I am very much interested in giving my time and energy to the SCCHA Board and all of its activities. I am soon to retire from my career, and have wanted to participate more consistently and regularly with the Association for some time now. I am a licensed therapist (MFT), have specialties in Critical Incident Stress Management (CISM), as well as Grief and Loss support to those who have lost a beloved person or pet. I also have been very successful as a grant writer for my agency. I have had Dancing Horse Stables, located in Felton, for 15 years, have a wonderful horse named Dancer, and am active in our Horse Evacuation team. I have lots of energy, good people skills, and am good at building things, working on the land, and taking on challenges. 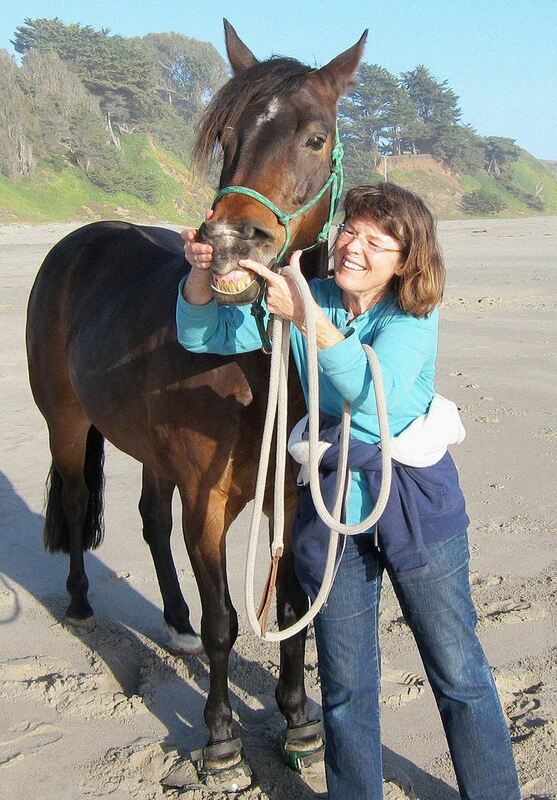 I am a life member of both Santa Cruz County Horsemen's Association and USPC/Santa Cruz County Pony Club, and have been involved with both clubs since 1974. I am a Graduate "B" Pony Clubber and have instructed and judged for USPC throughout the nation. I am currently a member of the SCCHA Board of Directors, among the Grounds Committee and am the Adviser for the Junior Program. My goals for the club are to encourage junior membership, rebuild the cross country course and continue to improve and preserve the facility for use by all members. I encourage ALL members to get involved with the club by volunteering at events, help maintain the facility at work days or select from our "Honey Do List" that will be posted on the website soon. I have been on the board for two years now. As your current Event Calendar Secretary I hope to continue to help bring fun, interesting and affordable events that appeal to all our members at Santa Cruz County Horseman's. One of my initial goals was to bring back The Battle of The Barns. With the full support of the rest of the board I was able to do that. We are going to have the Battle of the Barns again this year with even more fun and challenging events. By being on the board I hope to assist the other board members with their projects this year such as bringing in new horse shows and trail challenges. Thank you for your support. I have been a horse person for a little over 50 years. My horses have lived with me on our property the entire time so they have been like water and air, essential for my life. My love for horses goes beyond the desire to ride them for sport, they are family to me. When my horses are ready to retire they stay with me until their last breath. I have over 30 years experience owning my own business, specializing in accounting, finance and computerized systems. I have maintained hundreds of client relationships in a variety of industries. I’d like the opportunity to give back to the Club that has given me so much throughout the years. Thank you for your consideration. I have enjoyed serving on the board in several capacities over the past decade .... President, grounds manager, director and, party maven. I have also planned and/or worked on many events and projects, including Camp Cutloose, Battle of the Barns, Fireworks 30/50, the annual holiday parties, the roundpen, back trail/road and the coming shade structure. I cherish the horses and their people that have become a large part of my life through SCCHA and truly love sharing the horse life with my grandchildren. I am glad to serve on the board as a way to give back to our equestrian community. Manager for AT&T, I’ve managed a small successful boarding facility for almost 20 years, I am the mother of two girls age 12 and 14, and I spend as much time riding horses as I can. Our current Board has made lots of progress and improvements over the last year as a result of the membership survey that went out last winter. I would love the opportunity to see those projects through in 2019. Thanks for your consideration. I am a current board member, serving as the club’s membership secretary. I enjoy supporting club activities that bring members together with their horses. I have hosted and volunteered at multiple events, helped launch the club’s website, and like to find ways to help members throughout the year. In the upcoming year I look forward to facilitating upgrades to the large arena and cross-country course, assisting with the club’s newsletter, supporting membership renewal, and hosting obstacle events at the showgrounds. I respectfully ask for your vote in order to continue serving on the SCCHA Board of Directors. I have been Treasurer of the SCCHA for the last year. I am married, in my late 50’s and enjoy our three family horses. I have been working to improve the accountability and books of the club. We have made many improvements over the last year and I would like to continue over the next year to keep the ball rolling. I am asking for your vote and support to continue the work. Thank you. Our club/showgrounds is a real gem. It is important that the people who represent the membership, ie board members, are absolutely dedicated to its continued prosperity. Being on the board allows me the opportunity to give something back to the community where I have coached and trained for so many years. I am again running for club secretary. I take seriously the need for keeping an accurate written record of meetings and decisions made. Thank you! I have been on the SCCHA board for 14 years, serving as the membership secretary for most of that time. I have also organized a variety of things from horse shows to the St. Jude's Rides at the McCreary's. For the past five years, I have managed the Ride for Relay, a fundraiser for the American Cancer Society which has also become a fun event for our youth riders. I look forward to continuing SCCHA efforts to attract young riders. Come learn a skill that can save someone's life! The cost of the class is $40 (but free if you are a resident of Felton or work in Felton). Please RSVP to Kathy Rodoni so we can get a headcount and determine what the level of interest is for this event. Please join us to honor and thank John and Deb Fox with a GRAND Party and Dinner!! John and Deb are starting a new chapter in their lives and are moving to Arizona. Please join us to celebrate and thank them for their innumerable contributions to the equestrian community , especially the creation of the Large Animal Rescue . As a parting gift, the Foxes will provide a short training on barn safety. 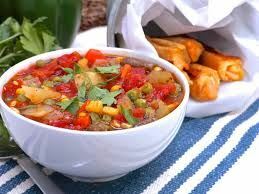 The club will supply a main dish - please bring a side dish or dessert to share. Hi folks, sorry for the last minute notice! The storm is wreaking havoc on so many things today, including our planned meeting. Power outages, dangerous roads, trees down...we feel it best to cancel the meeting and have you all stay home, safe and dry. Tuesday, January 15, 2019 at 6:30pm. Come join us and warm up with some hearty, delicious hot soup provided by the board members and yes, win BIG at Bingo! Just how big is up to you. Please bring something for our prize table** (re-gifting anyone?) and winners will progressively choose their prizes. Everyone goes home with something. We’re all winners in 2019! ** Not wrapped… unless you want to be mysterious about it! 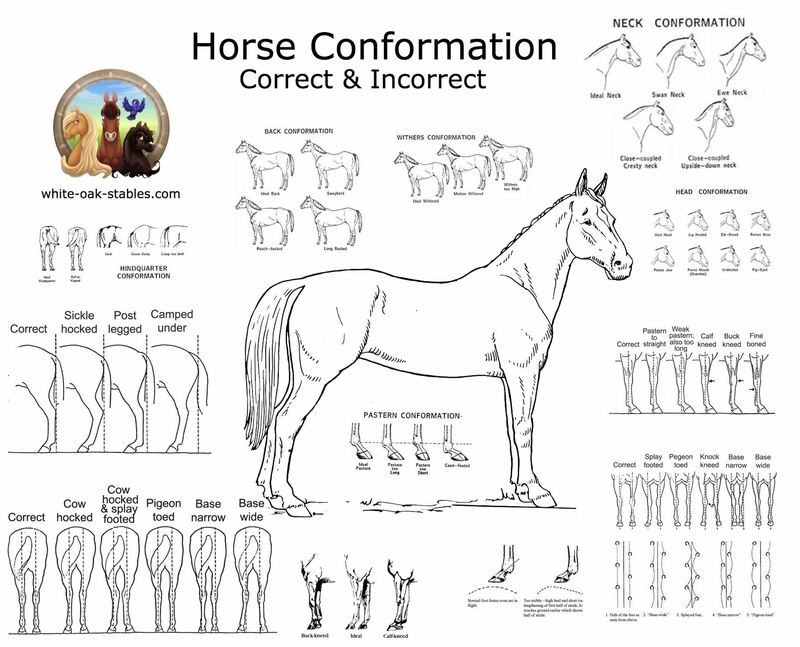 Come learn about how a horse's conformation can impact it's health and movement. Please bring a model horse (Breyer) or photo of a horse to evaluate. Folks, with the new year comes our planning for the 2019 board elections. While we do have the current board working well and happy to continue, we are also asking any other member who might be interested in being on the board to let us know now – we love new talent! There are two categories of board members - our general Board Directors and 3 elected officers – President, Treasurer, and Recording Secretary. The general board directors are in charge of membership, the calendar, trails advocacy, our grounds, the junior program, and more; these folks manage those areas with help from other board members and members at large. The President and Treasurer positions are more specific and demanding, and the person in those positions has to be up to speed day 1. While anyone can run for the elected officer positions, it is a good idea to have some experience with or on the board first. You should also have the experience outlined in the descriptions, and the time to devote to keeping things running smoothly. Any member over 18 is welcome to serve as a board director. We have monthly meetings, about 2 hours long, and one long planning session in January. A new director generally takes the first year to get up to speed before taking a leadership role in one of the areas of responsibility, so don't worry about not knowing a lot about the club's inner workings to start. What we are looking for are folks with lots of enthusiasm for our club and a desire to keep it running well, while offering great programs, classes, clinics, and events from all equine disciplines. Being a board member can be lots of fun and very satisfying. At the same time it comes with both a working and fiduciary responsibility for SCCHA. We are quite a prominent horse club in this area with a great reputation – come help us keep that going! If you are interested, contact Debbie Boscoe or Heather Shupe and let's get you on board, or at least on the ballot to get on board! We'd love to hear from you at or by the next membership meeting on 1/15, but understand if you need a little more time. We will put the final ballots together one month prior to elections. Everyone had a great time at the Battle of the Barns! Check our website for a message from Event Manager Carol Kelley as well as a slide show of photos!